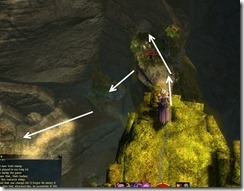 Griffonrook Run in Guild Wars 2 is a jumping puzzle located on the west side of the Lornar’s Pass. 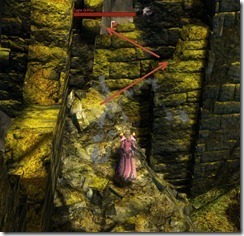 This is a guide for that puzzle with the most optimal route for carrying the bomb. The puzzle itself too bad if you just want the achievement but if you want to get the chest a the end, it gets a lot harder. 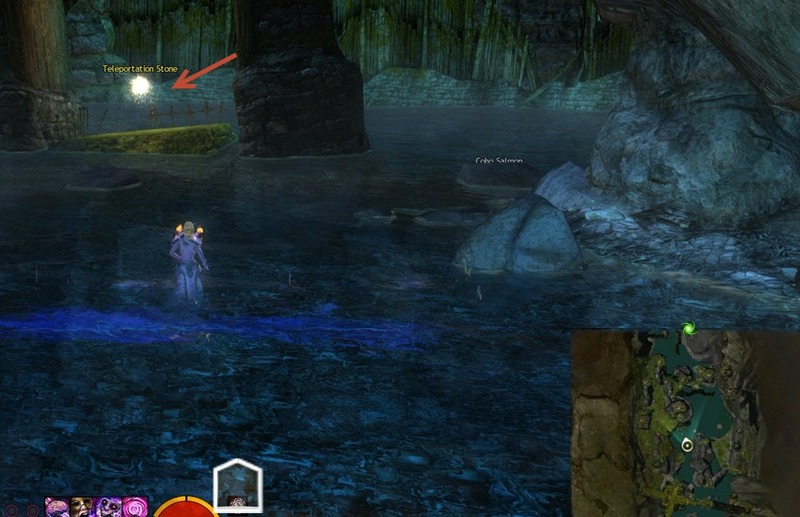 To get the chest at the end, you have to carry the bomb from the Norn NPC to the end of the jump puzzle without getting hit even once from the griffons in the area. It will take a lot of practice, luck, and well timed dodges to get the bomb to the chest. 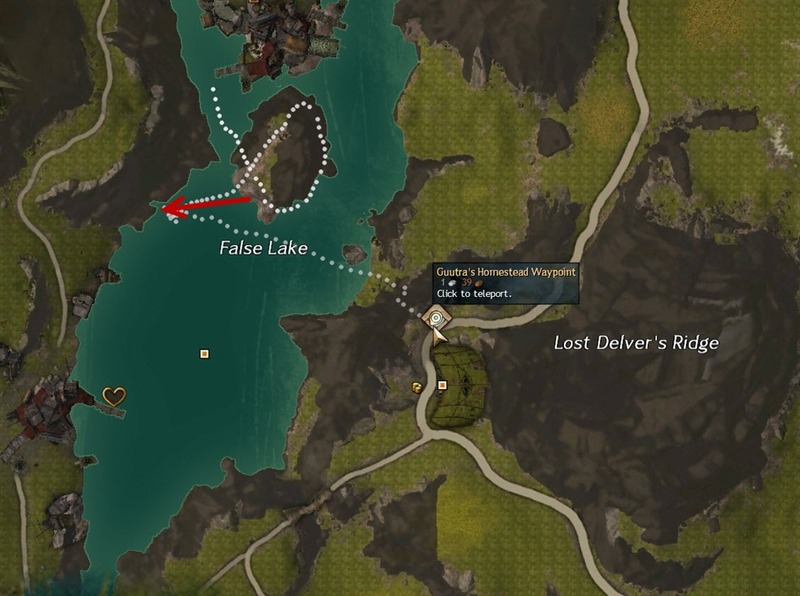 The Griffonrook Run puzzle entrance is well hidden, you need to head into the lake west of Guutra’s Homestead Waypoint in Lornar’s Pass and then go to the west edge of False Lake. 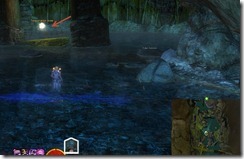 There is a well hidden crack in the wall near the surface of the lake where you can enter that lead you to the area for the puzzle. 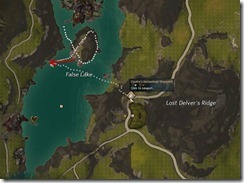 Once you are in the puzzle area, head north and look for a teleportation orb. That orb will teleport you to the top of the puzzle with the NPC that hands you the bombs if you wish to open the chest at the end. You have 3 minutes to get to the chest with the bomb before it blows up (won’t kill you but will knock you down to the ground for a couple seconds). Once you are up, you need to go left. If you have speed boost, you can jump up the rock wall. If you don’t have it (i.e. 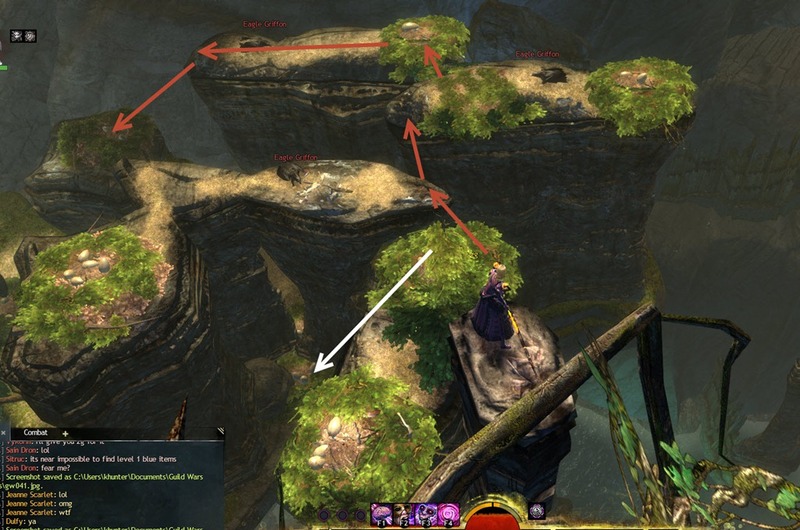 when you are carrying the bomb), you can jump down and avoid the two griffons there (you can summon pets/clones etc to distract them while you do the jump). If you choose to jump down, you will need to jump on the pile here and then onto broken wall to pass through the hole in the wall. 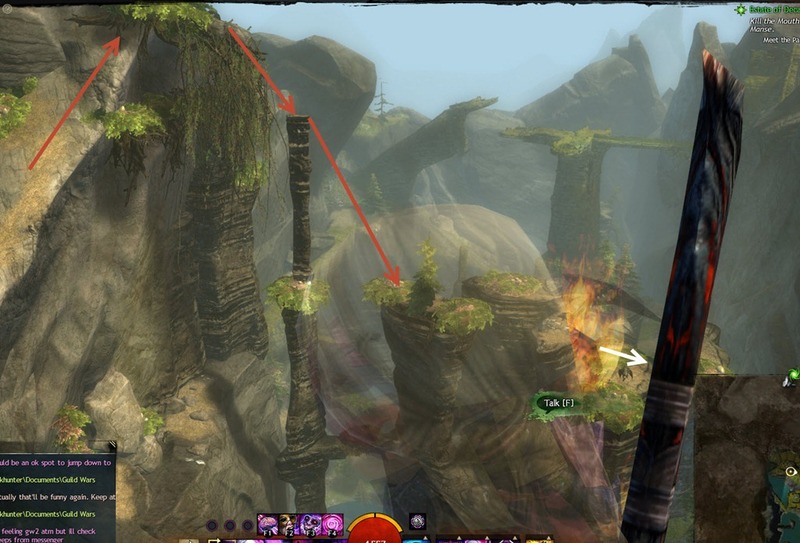 Then you need to run all the way up, go through two griffon nests when you can’t go any higher and then make the jump to the pillar below. 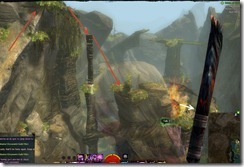 Becareful here if you are carrying the bomb as sometimes the griffon can spot you while you are running towards them and attack you before you have a chance to dodge. From here, you have two paths. 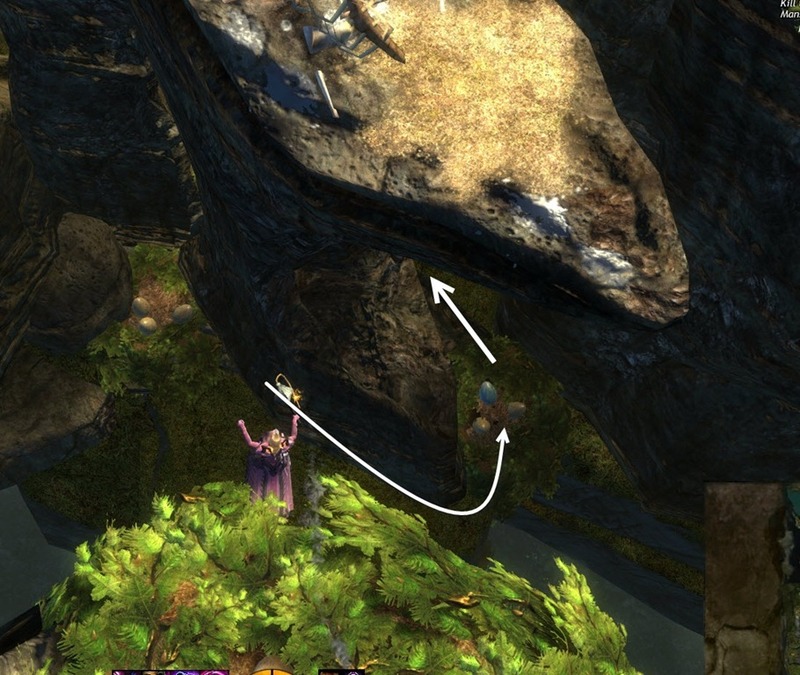 You an either jump through the three rocks guarded by the three griffons (red arrows) or just jump down to the ground under the first griffon (white arrows). 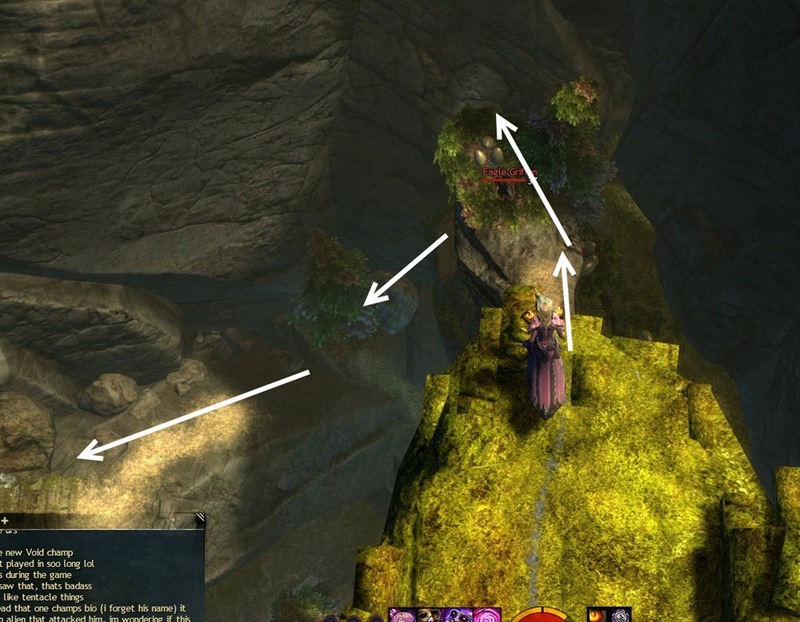 I personally prefer the white arrow route as I tend to get whacked by these three griffons while jumping mid-air. 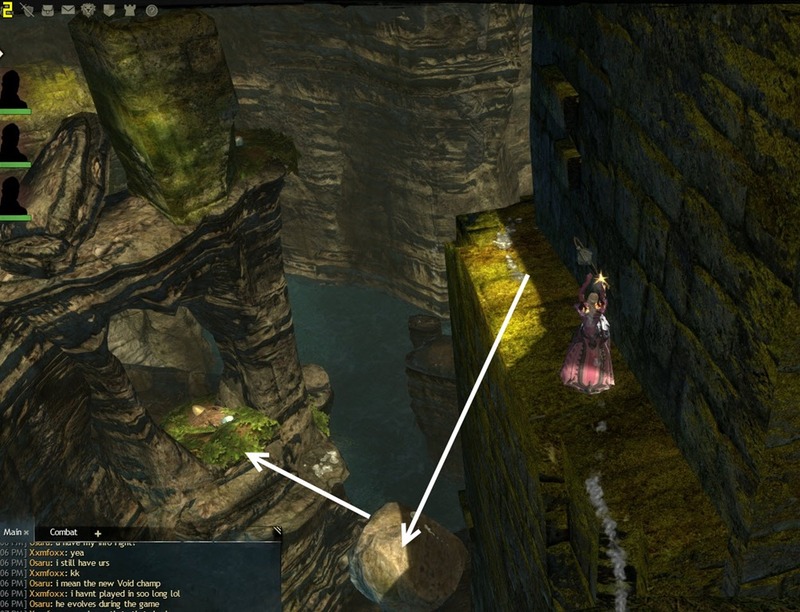 If you do decide to use the white arrow route, jump down to the base of the pillar guarded by the first griffon and then run around to grab the egg with the speed boost. 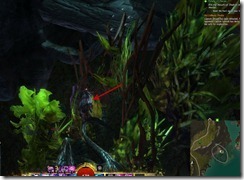 You will need to run through some griffons, make sure to dodge roll if you see them get there. You have enough endurance for two dodge rolls before you need recharge so use them wisely. 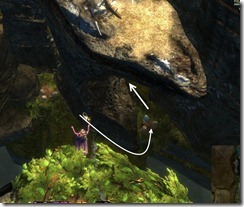 The rest of the puzzle is fairly easy, regardless of which path you took, you will end up here and need to make a big leap down below. The griffon will come rush you as soon as you land so just heal up as you run towards the griffon and make a dodge roll once you get near. 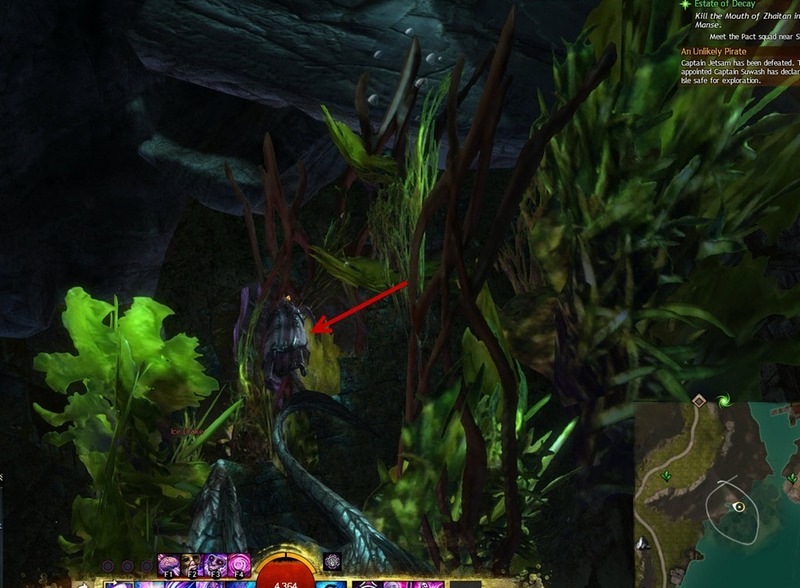 There is also an egg near the griffon that you can use to heal up (is to the right of the griffon) but it is risky so I tend to just use my self heal. You can start differently and save a lot of time. If you can do a flip jump you can get on the wall next to the hut where you start. Just get up on the roof then flip jump against the wall you will stick on a protruding stone then be able to hop up on top of it. 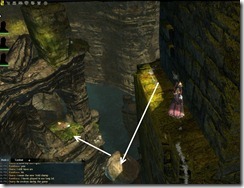 This lets you run down the outer wall and can be done WITH the bomb. 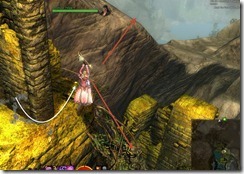 PS a Flip jump is when you hit dodge and jump at exactly the same time. 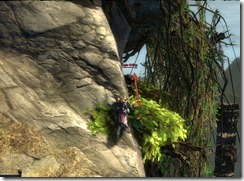 This jumping puzzle was so cool and fun, right Dulfy? I’ve found it makes it easier to run through the first couple of bird groups (before the jump to the tall pillar), kill them, and jump off the cliff to die. Revive, then run back through without having to worry about them. It isn’t necessary to kill the second group, but the first presents serious difficulty. If you just want the achievement, there is no need to carry the bomb at all. 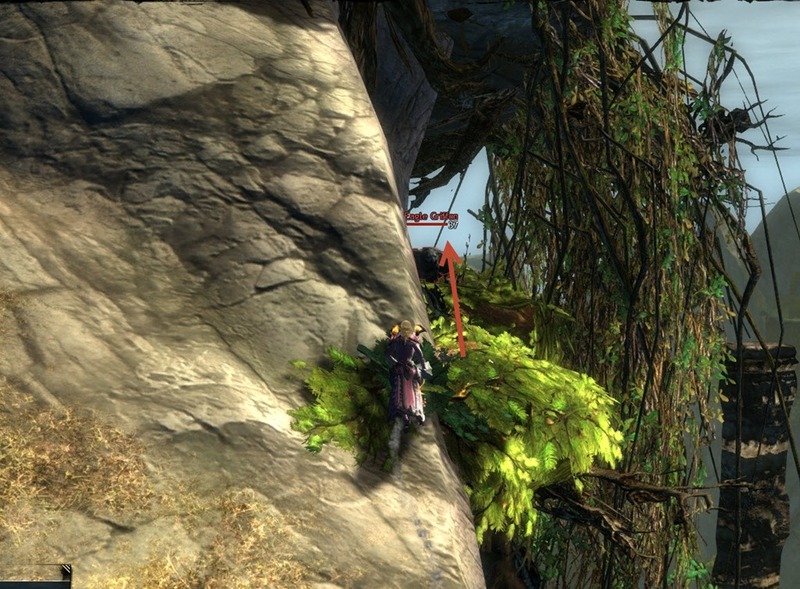 Just follow the path without any worries about getting hit by the griffons. Obviously you won’t get the chest at the end but there are much less painful way of getting shinies in this game. k so i made it to the chest WITH the bomb and it wouldn’t open. WTF? 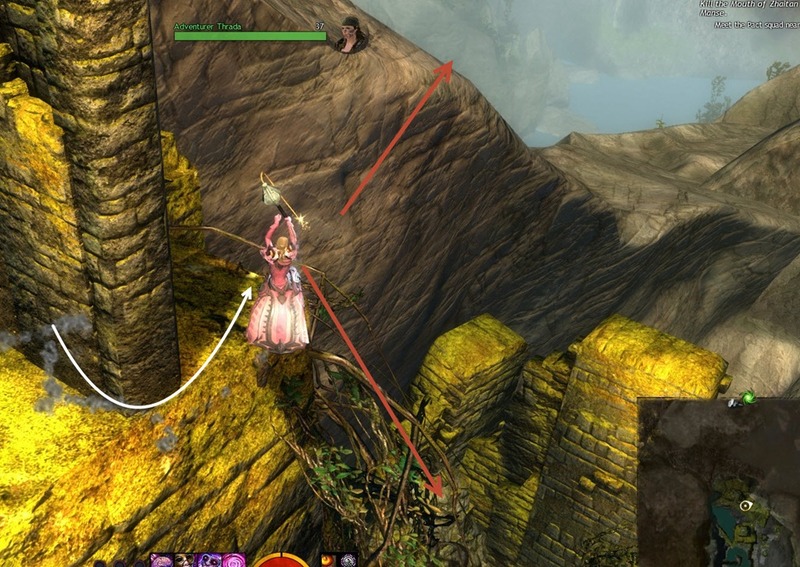 So, I’m way late to the party, but if you’re really set on the chest and are having problems with griffons, bring someone with who can kill them so they don’t hit you while you’re running the puzzle.